Green States are where we currently manufacture our residential systems, click on the State for more information. 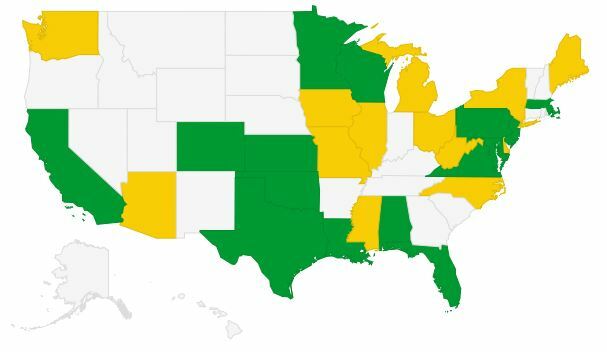 Yellow States indicate where we have either Statewide or local approvals to install our systems, just no manufacturing, yet. However, we often deliver into these territories from neighboring States. Commercial Systems are available Nationwide. Contact Hoot directly via the form on the right for more information on the clear States. Alabama Arizona California Colorado Delaware Florida Illinois Iowa Kansas Louisiana Maine Maryland Massachusetts Michigan Minnesota Mississippi Missouri New Jersey New York North Carolina Ohio Oklahoma Pennsylvania Texas Virginia Washington West Virginia Wisconsin State Not Listed?